Assistant Professor (Bioinformatics) - 1 Post for MBC - Consolidated Pay 45000 pm - Post Graduate with UGC NET / SET / SLET / PhD. 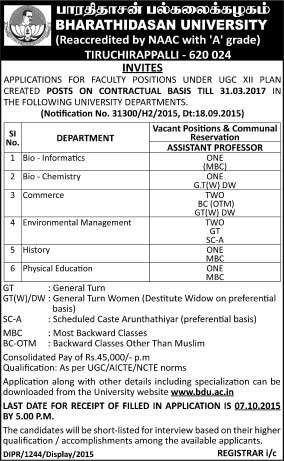 Assistant Professor (Biochemistry) - 1 Post for UR Destitute Widow - Consolidated Pay 45000 pm - Post Graduate with UGC NET / SET / SLET / PhD. Assistant Professor (Commerce) - 1 Post for BC ; 1 Post for UR Destitute Women - Consolidated Pay 45000 pm - Post Graduate with UGC NET / SET / SLET / PhD. Assistant Professor (Environmental Management) - 1 Post for UR ; 1 Post for SC Arunthathiyar - Consolidated Pay 45000 pm - Post Graduate with UGC NET / SET / SLET / PhD. Assistant Professor (History) - 1 Post for MBC - Basic Pay 15600 Academic Grade Pay 6000 in Pay Band III - Post Graduate with UGC NET / SET / SLET / PhD. The above faculty recruitment process are under contract basis appointment upto 31st March 2017 in UGC XII plan.